Well, we are at that all too familiar point in the season. The point at which Reds fans reflect on everything that went wrong during the season and try to figure out what what needs to be done to contend in the following season. This post will focus on the latter, but posts will undoubtedly return to the former in the not too distant future. After a disappointing season, the pundits have turned on the Reds. After being hailed as the darkhorse in the NL earlier this year by many in the media, they are now being buried just a few months later. It's a bit surprising that there is such a massive swing in media opinion. Ideally, they would take the time to form an objective opinion about the health of the organization, rather than being so swayed by the 2009 W/L record. Personally, I think it's difficult to look at what the Reds have done as of late and not see an improved squad. You can certainly argue that the Reds overpaid for Scott Rolen, but you can't argue that he's not an upgrade over Edwin Encarnacion. The emergence of Drew Stubbs in centerfield represents a clear upgrade over Willy Taveras. At the bare minimum, Stubbs and Rolen represent a significant upgrade in run prevention, but both are also likely to be substantial upgrades on offense. Add in a healthy and improved Jay Bruce and a potential big step forward for Homer Bailey and the Reds could be a solid team in 2010. Still, to me, the biggest determining factor to the success of the Reds next year will be what they do with Yonder Alonso. Yonder Alonso is currently the biggest chip the Reds possess, but they need to figure out how to maximize the value of that particular asset. The ability to extract the most value from Yonder Alonso may well determine the organization's success in 2010. The purpose of an MLB farm system is to support the success of the Major League team. There are two ways for an organization to use its farm system to support the MLB team. A perfect example of the differing ways to utilize prospects are the Oakland A's and the San Francisco Giants over the past decade. The Oakland A's have focused on developing prospects and making use of them at the big league level. They extract the value of the first 6 years of cost-controlled production from their prospects and then deal them when they get expensive for more young prospects. The San Francisco Giants took the opposite approach. They traded away prospect after prospect to acquire establish veterans to round out the roster around Barry Bonds. The Giants wanted to win while Bonds was still on the team and their philosophy removed the inherent risk of prospects and allowed them to acquire players who were already past the growing pains stage of their MLB careers. Since Bonds has retired and the Giants have suffered through some lean years, they have switched their focus to developing homegrown talent. Judging by their success, each strategy has merit. Judging by their struggles, each strategy has flaws. Obviously, a blended approach is best. The general sentiment in the Reds nation seems to be keeping Yonder Alonso and shifting Joey Votto to left. Personally, I'd rather seem them trade Yonder for a player that better suits their needs. A few years ago the Atlanta Braves promoted Jarrod Saltalamacchia to the majors and were left with a catching conundrum. They already had Brian McCann entrenched behind the dish, but Saltalamacchia was one of the more promising young prospects in the game. Still, there wasn't room for both behind the plate. There was talk of shifting Salty to first base, but the Braves elected to deal him to the Rangers instead. The Braves were smart enough to recognize that Salty's value was largely tied to being a catcher, which made his trade value higher to his actual value. In short, his value as a catcher for another team was higher than his value as a first baseman to the Braves. When trade value outpaces actual value, then a trade is necessary for the organization to maximize the value of the asset. Now, obviously, the loss of positional value from a shift from first base to leftfield isn't as significant as a shift between catcher and first base. Still, moving Votto to left to accommodate Yonder will result in a significant downgrade on defense. The presence of Joey Votto at the MLB level may well mean that Yonder's value to other teams is higher than his value to the Reds. Overall, it seems like there is better total value (offense + defense) to be reaped from trading Yonder than there is in keeping him. The obvious holes on the Reds 2010 lineup are at shortstop, catcher, and leftfield. If the Reds can flip Yonder to get an impact bat at one of those positions or fill two of those slots with solid players, then a trade would be the better course of action. The Reds have the makings of a solid lineup in 2010, but they need to start utilizing the farm system to support the major league team. They have value in the farm system, but it may not be the type of value that they can easily plug into the MLB lineup. The better option at this point would be to trade it for an asset that better fits the organization's needs. The Reds aren't too far off from being tough to handle, but they need to use the value in the system to support the MLB team. Over the past few years, it seems that the Reds are not extracting the maximum amount of value from their developing farm system as they should. This would be a good offseason to change all that, as a shrewd move or two will put the Reds in good position to compete in 2010. Juan Francisco Gets the Call. What does it mean? 143 games into the season, the Reds decided to promote Juan Francisco. 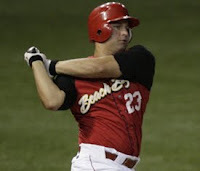 The 22 year old was coming off a stellar 2009 season in which he had a slash line of .295/.329/.518/.847 with 27 homers and a 115/24 K/BB ratio spread over two levels of the minors. The acquisition of Scott Rolen saves us all from having to watch Francisco hold down the hot corner. In the minors, Francisco posted an absurd 39 errors and scouting reports are dubious as to his defense. He has plus arm strength, but was unlikely to ever be more than Edwin Encarnacion Part Deux on defense. Why Francisco instead of Todd Frazier? I would imagine that the obvious question that leaps to the minds of most Reds fans is why Juan Francisco over Todd Frazier? There really doesn't seem to be a good answer to that question. Frazier is a year older and as a college player he's quite simply the much more polished prospect. Juan Francisco is a year younger and his overall skill set is much more raw. Between double-A and triple-A, Francisco has a line of .295/.329/.518/.847, while Frazier has a line of .292/.351/.481/.832. Pretty similar levels of production, so why has Frazier been bounced from defensive position to defensive position and been basically treated like a future utility player, while Francisco plays horrendous defense and still gets the coveted September call-up? The only thought that leaps to mind is that the Reds value players with one elite skill higher than the "Jack of All Trades, Master of None" type players. Juan Francisco displays true light-tower power, but little else. Todd Frazier lacks flash, but is a very solid, heady ballplayer. Another example would be the Reds belief that speed demon Willy Taveras is actually a valuable Major League Baseball player. He lacks any other discernible skill, but the Reds love the one elite skill that he possesses. For better or worse (I'd argue the latter), the Reds seem dazzled by an elite tool to the exclusion of all else. The Reds prefer one elite tool to an overflowing toolbox. Of course, in this case, that leads to Juan Francisco, not Todd Frazier. What is the future of Francisco in the Reds Organization? The Scott Rolen acquisition forecloses an option that should have already been ruled out. The idea that Francisco could play a competent third base at the MLB level was unrealistic in the best of times. Now that Rolen is in the mix, Francisco will officially have to be moved to a different position. As I mentioned in my most recent prospect write up of Francisco, his inevitable slide down the defensive spectrum would reduce the value of his bat. Now that time is upon us and I have questions as to whether his bat can carry him at an offense first position like leftfield or first base. Obviously, first base is occupied by Joey Votto and Yonder Alonso would rank higher up the depth chart than Francisco. And, quite frankly, I have questions as to whether he can be even an average leftfielder. What good does it do to have a potentially above average offensive talent if he gives away all of his above average production with his below average defense? So, what does the future hold? Are the Reds calling him up because they view him as a viable option in leftfield for 2010? Given that Drew Stubbs and Jay Bruce are going to hold down two of the three outfield slots and Chris Heisey, Jonny Gomes, Chris Dickerson, Willy Taveras, and Joey Votto/Yonder Alonso in the mix for the final slot, that may not be a workable option. The other option is that the Reds are calling up him simply to showcase him for a potential trade this offseason. This strikes me as the better option. The function of the farm system is to support the Major League club and that can be done by promoting homegrown talent or by trading prospects to acquire pieces that are a better fit for the team's needs. Given the Reds preference for players with an elite tool and Dusty Baker's previously expressed admiration for Juan Francisco, they are likely giving Francisco a legitimate audition for a starting job in 2010, despite the fact that he might ultimately bring more value to the organization in trade. Just when the Reds 2009 season was becoming borderline unwatchable for even the hardiest fans, a shot in the arm arrived in the form of centerfield prospect Drew Stubbs. For fans who grade out as something above "casual fan," the opportunity to view top prospects can make an otherwise unwatchable season somewhat watchable. Stubbs is one of the Reds top prospects, though one whose selection in the draft came with one of the biggest opportunity costs in MLB history, but has been languishing in the minors. Perhaps to the point of stagnation, as he had really done as much developing as he was likely to do. In fact, there were rumblings from the fans that the Reds should have brought Stubbs up for a cup of coffee last September. Still, the Reds were probably right in their belief that Stubbs wasn't quite ready last September, but may have kept in the minors a bit too long. In the minors, Stubbs was working on a slash line of .268/.353/.360 with a 104/51 K/BB ratio, 46 steals in 54 attempts, and a paltry 3 homeruns in 411 At Bats. Suffice it to say, Stubbs' prospect star tarnished a wee bit in 2009, due in no small part to his power outage and the performance of Chris "Supernova" Heisey. Still, Stubbs has reopened some eyes with his performance at the MLB level thus far. He has matched his full season minor league homerun total in less than 61 MLB At Bats. In my book, Stubbs' value is tied to his power output. He can be a very nice player if he hits only single digit homers. Still, if that's all the power he provides, then he's a complimentary player. However, he can be a true impact player if he can hit 20+ homers a season. Time will tell. Not only does he already have 3 homeruns, but he's driven several more balls deep into the outfield that have settled into the gloves of fielders, including a fastball from Matt Cain that reached the warning track. Still, he's already cranked three homers, so it's looking likely that Stubbs can run into 10-12 homers a year almost by accident. So, maybe 20+ bombs and a future as an impact player isn't out of the question. Hopefully, Stubbs' power production doesn't completely fall off the table a la Chris Dickerson in 2009. He's already swiped 3 bases on the year, which should be an indication of what's to come in the future. Stubbs could be the big time threat on the bases that the Reds sorely need. I've always liked Stubbs' swing. He stands tall up there and has a smooth, fluid righthanded swing. Contact has always been a problem, in part because of his height and longer arms, but his swing produces line drives at a good clip when he does make contact. During his brief MLB career, Stubbs is hitting line drives at a 22.5% clip, which is very strong. Admittedly, it's a small sample size, but at the very least you have to appreciate the swing. Obviously, this has always been the concern with Stubbs. Whether he can make enough contact to take advantage of his power and speed. Typically, I don't worry too much about strikeouts. I'm a big believer in the value of late-count hitters and one of the byproducts of such an approach is a significant number of strikeouts. Still, there is a tipping point at which the lack of contact and putting the ball in play becomes a real drag on offensive production. His minor league career stats and his early 2009 MLB stats indicate that Stubbs may live dangerously close to this tipping point during his MLB career. Now, I'll preface this by saying that Stubbs certainly has all the tools to be one of the premier defensive centerfielders at the MLB level, which is undoubtedly what he'll become. In fact, he's shown flashes of it already, but I just haven't seen him translate his considerable skills into top drawer defensive play. Stubbs seems to have a good first step and covers a lot of ground in the outfield, but he has taken a few strange routes to the ball and hasn't taken charge on a couple of balls in no mans land like a centerfielder should. Overall, I'm not worried about his defense at all. He's clearly a defensive stud in the making and any problems he is having at the MLB level likely stem from the learning curve of Major League Baseball. I'd imagine that he is still getting used to the size of big league ballparks, which have upper decks not seen in the minors. The more massive ballparks can take some getting used to for outfielders. Also, Stubbs is likely going to get more and more comfortable taking charge on the field. Maybe he didn't feel comfortable running the show in the outfield as a rookie, but that certainly won't last long. There is one point of interest on Stubbs and his defense. The only criticism I have ever heard of his defensive ability is that he sometimes has difficulty going back on the ball. And, while the sample size is very small, John Dewan's +/- system may well bear that out. In 2009, the +/- system rates Stubbs as a net 0, as he is a +2 on Shallow balls in play, a +3 on Medium balls in play, and a -5 on Deep balls in play. I would imagine that a larger sample size will put an end to that trend, but it's interesting to note that his early season performance is somewhat in line with scouting reports on his defense. Overall, Stubbs has impressed me during his debut. I was rather concerned about his utter lack of power this year in the minors, but his early MLB performance indicates that the power is lying just under the surface. Whether the power shows up or not, it'll be nice to have a gazelle like Stubbs patrolling centerfield for the foreseeable future. The only people who will enjoy watching Stubbs glide around the outfield more than the fans will be the Reds pitchers. Like most Reds fans, I'm excited to see what the future will hold for Stubbs and I'm thankful that there are still a few things worth watching in the 2009 Reds season.